This article is part 16 of a series of articles featuring the ODI Working Paper Exploring the science of complexity: Ideas and implications for development and humanitarian efforts. The next four concepts relate to different aspects of how complex systems – those characterised by Concepts 1-3 – change over time. The causal relationships that play out within complex systems are explained using the concept of nonlinearity (Concept 4) and the sensitivity of complex systems to their starting conditions is highlighted (Concept 5). The overall shape of the system and its future possibilities are described using the idea of phase space (Concept 6). The patterns underlying seeming chaos within complex systems are explained (Concept 7). The concept of phase space and attractors are central to understanding complexity, as complexity relates to specific kinds of system trajectories through phase space over time. The behaviour of complex systems can at first glance appear to be highly disordered or random. Moreover, these systems move through continually new states, with change as a constant in a kind of unending turbulence. However, there is an underlying pattern of order that is recognisable when the phase space of the system is mapped, known as a strange attractor. In the 19th century, a mathematician named Henri Poincare was using Newton’s equations of planetary motion, which were – as has already been covered – based on a number of assumptions of linearity. Poincare proved that this approach worked for simple planetary systems of two bodies. In order to test the applicability with systems of three bodies – e.g. the sun and two planets – Poincare used tools that were based on the same principles as phase space to map the movement of such systems over time. He found the trajectory of the system to be one of ‘awesome complexity’ 1. The idea lay more or less dormant until the 1960s, when the Lorenz experiments showed that computer-aided modelling could be used to identify complexity. Until the 1960s, there were only a few known attractors – including fixed points and periodic (as described previously in concept 6). All of these attractors related to systems that are predictable, in terms of understanding where they may end up. However, complex systems that are hard to predict also have an attractor, but they are much harder to map without the use of computers. The attractor for complex systems was discovered by Lorenz (shown in Figure 1). Most commonly known as strange attractors2, these are at the heart of the understanding of complexity. Strange attractors show how complex systems move around in phase space, in shapes which resembles two butterfly wings3. A complex system – such as the three-body planetary system, or the weather – would move around one loop of the attractor, spiralling out from the centre. When it got close to the edge of the ‘wing’ it would move over to the other ‘wing’ and spiral around again4. Complex systems can have a chaotic dynamic, and develop through a series of sudden jumps5. Such a jump, usually referred to as a bifurcation, is an abrupt change in the longterm behaviour of a system, when the value of a particular dimension becomes higher or lower than some critical value. 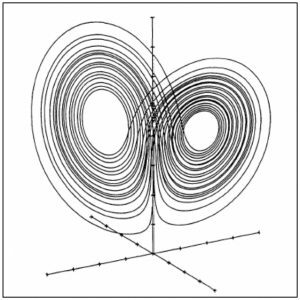 As one gets close to the bifurcation points – which may be seen as those points where the system moves from one wing of the attractor to the other, the values of fluctuations increase dramatically. This strange attractor shows that complexity – although seemingly completely disordered, actually displays order at the level of its trajectory, and that although it may be unpredictable in its detail, it always moves around the same attractor shape. This ‘narrowness of repertoire’ is at the heart of the order hidden in complexity. Figure 1. The strange attractor (source: adapted from Mendenhall et al. 19986). Such systems do display order, albeit not in the regular sense expected with linear systems. Instead, the order relates to the shape or pattern that the behaviour of a system displays in its phase space over time. At a more general level, the notion of strange attractors and bifurcations implies that, despite chaotic or turbulent behaviour, the dynamics of complex systems can be investigated and understood. With the use of these tools, complexity scientists have been able to shed light on situations where there is no settling down to a stable equilibrium, no stable states and no repetition. Instead, there are systems undergoing continuous change, driven by the various factors and actors that shape and make them. This process of continuous change is often referred to as far from equilibrium, or ‘unending turbulence’. Box 1 provides a more detailed look at the concept of ‘edge of chaos’, with specific reference to urban planning and urban regeneration. Attractors suggest that systems are understood in terms of the two extremes of order and chaos. The metaphor of solids and gases can be used to clarify this. In solids, atoms are locked into place, whereas in gases they tumble over one another at random. However, right in between the two extremes, at a phase transition, a phenomenon called the ‘edge of chaos’ occurs. This phenomenon describes systems behaviours where the components of the system never quite lock into place and never quite dissolve into turbulence either. In human organisations, the simplest example is of a system that is neither too centrally controlled (order) nor too unorganised (chaos). The key question for many thinkers, who suggest that the edge of chaos is the place of maximum innovation within human systems, is how complex systems get to the edge of chaos. The illustration above on solids and liquids suggests, logically, that ordered systems can achieve this by loosening up a bit, and chaotic ones can do it by getting themselves a little more organised. A study of urban planning has suggested that the edge of chaos principle relates to the evolving relationship between local authorities and local communities in Hulme, Manchester. This shaped decision-making processes, steering a path between the two extremes of centralised order (local authorities) and bottom-up chaos (community groups). Using social network analysis, the diminishing gap between authorities and communities was measured, drawing conclusions about the strength of the ties and frequency of interaction between the two groups over time. It was found that, from 1960–85, decision making was enshrined in the notion of local authorities making decisions for local communities without the latter being consulted. 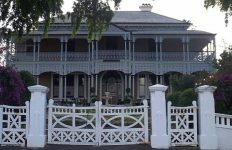 By the mid-1980s, consensus was beginning to loosen up under the exigencies of the (emergent) local community networks, moving from the highly centralised ‘we know best’ spirit of the 1960s to an acceptance of the opinions of community groups as useful and valuable in the decision-making process. This represented a massive change and paved the way for real progress in Hulme in the 1990s. Hulme as a system was searching for the edge of chaos, a special kind of balance (in decision making) between central control and the power of community networks. An important point to note here is that nobody designed the search process for the consensus that ensued – the system itself found the balance. A programme was then launched which was able to flourish on this fertile ground of strengthened community–authority interactions. Subsequent evaluations on the regeneration processes highlighted that the success of the initiative came about because it was at a particularly innovative point for community–authority relations. This highlights a potentially fundamental insight into the understanding of the urban system in general and urban regeneration processes in particular. If social systems cannot best be described by reference to fixed point or periodic attractors, this means that social phenomena should not be viewed as tending towards equilibrium, as having defined endstates, or as being cyclical. A more apt metaphor, and one which may help to further understanding, may be to view them as open systems that exchange energy, matter or information with each other and their environment, and that continually create new structures and order 16. Nobel Prize winner Ilya Prigogine has referred to these as ‘dissipative structures’, in reference to his research on a wide range of systems that displayed such behaviours. Such systems can maintain themselves in stable states which are far from equilibrium, and can transform themselves into new structures of increased complexity. Prigogine’s analysis details how instabilities and bifurcations to new structures are in fact the result of fluctuations which are amplified by positive feedback processes. 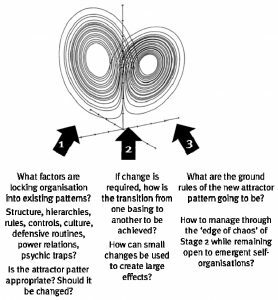 Gareth Morgan17 suggests that the idea of strange attractors provides a powerful perspective for the management of stability and change in organisations. Specifically, he suggests that transformational change ultimately involves the creation of new contexts that can break the hold of dominant attractor trajectories in favour of new ones. He uses the idea of a strange attractor as a creative metaphor (as shown in Figure 2) to generate thinking about organisational change, and in doing so raises an important challenge for managers of change processes. If organisations can be described using the attractor metaphor, then it is implied that managers cannot be in control of the change. The new pattern of the attractor cannot be precisely defined – it is only possible to nurture elements of the new context, and create conditions under which the new context can arise. When the old pattern – the old context – is particularly powerful, no significant change is possible, because the organisation ends up trying to do new things in old ways. Morgan sees that the power of this approach lies in its potential both to open up new understandings and possibilities for action but also, importantly, to outline the limitations in terms of individual actors’ control and power over organisational change processes. Figure 2. A strange attractor as a creative metaphor (source: Morgan 198618). This equally applies to the process of development in a country, or the adequate means of responding to crises. A particular issue in international aid may not be most usefully solved through the provision of a particular ‘output’. Rather, it may be more productive to see development as an open-ended, ongoing, unpredictable and continually changing process. Similarly, crises can be seen as bifurcation points in which human social systems are exposed to high constraints and stress ‘that upset the balance between the internal forces structuring the systems and the external forces that make up the environment’ 20. A crisis could then be defined as a condition in which there is a change in an environmental or human stress that is destabilising enough so that the original set of attractors is supplanted by a new set of attractors. Whether looking within aid organisations or outside them, this calls for better management of context, and to give up the idea of precise control in favour of the idea of the emergent nature of change. New contexts can be generated through new understandings, such that those operating in the system can be encouraged to challenge and change existing paradigms, norms and assumptions. For example, thinking of an organisation as discrete may lead those within it to try and help it survive as a discrete entity, instead of allowing it to evolve to a new form. New contexts can also be encouraged by identifying and changing the ‘basic rules’ which reinforce the existing attractor patterns, allowing new actions to emerge and become powerful messages for the kind of change that is being sought. These changes can help to catalyse other changes that are in line with the hoped-for new context24. The potential for small changes to lead to large, directed changes is explored by Holland in his work on ‘lever points’ of systems. Holland25 argues that such lever points could be the key to solving problems such as ‘immune diseases, inner city decay, industrial innovation, and the like’. The chaos metaphor suggests that there are bifurcation points that tip systems from one state to another – and, if these can be understood, then it may be possible to better identify such leverage points. This has been explored in the context of aid effectiveness26 by investigation of the premise that a relatively small intervention through small grants and technical cooperation assistance might cause a disproportionably significant impact. The study suggests that donors may already be funding these kinds of ‘high leverage’ initiatives, but that current reporting procedures and increasing interest in large-scale budget support may mean that these activities and the factors that might contribute to their success are not well documented. These factors are likely to include: the country-specific context; the approach of the donor agency to aid effectiveness; how it understands change; how it invests in relationships; its openness to a diversity of views; and its preparedness to experiment, take risks and learn to alter its views. All of these can be seen as ways to manage the context within which change happens. The inherent unpredictability of change in such systems also means that there may be significant value in an organisation increasing its ‘agility’. In systems characterised by ‘surprise and discontinuity … organisations need to rapidly adapt to unexpected conditions … they have to improvise’ 27. Thinking back to concept 5 and the implications for planning, this does not – as some claim – imply that strategy becomes irrelevant: ‘the idea of strategising for the future is fundamentally based on the unpredictability of the future, of which some aspects … can be foreseen’. To put it another way, working with chaos means ‘it is not about being strategic or opportunistic; it is about being strategically opportunistic’ (John Young, personal communication). It has been suggested that ‘the adoption of minimally structured organisational forms are a necessary condition for strategic improvisation’ 28. This should be done through a commitment to ongoing reflection and adaptation of aid programmes. Since the context in which a programme is operating is continuously changing, and it is not possible to plan for all eventualities, a successful programme is one that assesses and adapts to changing situations in an intelligent way based on thoughtful reflection. This means that the programme needs to be engaged in ongoing reflection and learning so as to remain relevant and appropriate. This shift towards ongoing processes of learning has some knock-on implications. 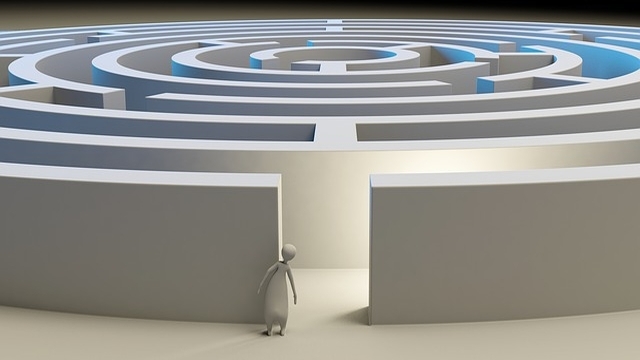 It has been suggested that this entails a move in attitude away from ‘knowing best’ (‘if one already knows the answer or knows best then there is no need to learn anything’)30, realising that there are ‘no final answers’ and we must approach problems with the mindset of ‘enquiry and not certitude’ 31. This could shift focus of policy from ‘specifying targets to be met’ towards ongoing work ‘based on learning what works, and towards improving overall system performance, as judged by the end-users of the system’ 32. But a chaotic system not only suggests that lessons themselves are permanently provisional33, but also calls for an approach to learning and decision making that is tailored to the specific situation. Although it is tempting to suggest methodologies that enable this kind of thinking to be implemented, such as soft systems methodology, or outcome mapping, or most significant change, in reality this reinforces the notion that tools are useful but no single tool should be expected to provide all of the guidance needed for decision making. Similarly, no single tool should be expected to provide the most appropriate means by which to arrive at guidance. The notion of strange attractors and chaos goes further and suggests that no single mindset should be seen as the appropriate to all settings. Researchers from IBM [Kurtz and Snowden]34 have done interesting empirical studies which relate to different kinds of organisational systems, with careful attention paid to those which feature chaotic dynamics. Kurtz and Snowden characterise certain decision-making and learning approaches as most appropriate to different kinds of systems. For example, approaches that focus on sensing incoming data, categorising it and responding in accordance with established practice are most appropriate in systems that are ordered and known, for example, when undertaking business process re-engineering, in which cause and effect relationships are seen as linear and understood. Examples of such approaches are single-point forecasting, field manuals and operational procedures. By contrast, approaches that focus on sensing data, analysing it and then responding in accordance with expert interpretation and advice are most useful in complicated systems, for example, organisational learning initiatives, or strategic futures planning efforts, where there may be stable cause-and-effect relationships, and in which everything can be understood, given sufficient resources and time. Examples are experimentation, expert opinion, fact finding and scenario planning. 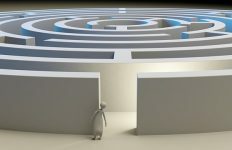 While structured techniques are desirable, underlying assumptions must also be open to examination and challenge. Finally, approaches that focus on sensing patterns of change and understanding multiple perspectives, and working to strengthen wanted patterns and weakening the unwanted are most appropriate in complex systems characterised by multiple feedback processes and interaction among many agents, emergent properties, nonlinear relationships and limited predictability. In such systems, many examples of which have been covered already, the application of structured methods will frequently confront new and different patterns for which they are not prepared, and approaches need to be tailored to the nature of the problem. Next part (part 17): Concept 8 – Adaptive agents.